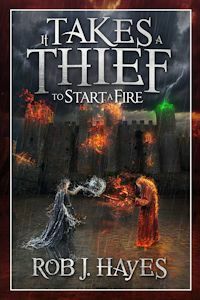 It Takes A Thief To Start A Fire is the second book in the It Takes A Thief… series. It follows hot on the heels of the events of …To Catch A Sunrise, and sees Jacques Revou and Isabel de Rosier adapting to life in Great Turlain and competing against a group of thieves who can control the elements. “We started our lives together with barely a coin to our name. We have won fortunes and lost them. We have stolen the un-stealable, survived plots and schemes determined to see us fall, and saved a Queen from certain death. But sometimes a fresh start is exactly what is needed and here we can have just that. Free from devious machinations and troublesome reputations alike. Here we can go back to our roots.